I found* a stack of ¼” ABS Rods in our Hatchery Lab two weeks ago. I slid one of the long pliable pieces off the shelf and began to test its ‘bendability.’ To my delight, it didn’t require any source of heat to make an impression and I quickly began bending the materials into shapes like an optometrist with a new pair of glasses. I used black zip ties to secure the skeletal structure at joints towards the back of the skull, knowing any extra bulk would affect the silhouette. 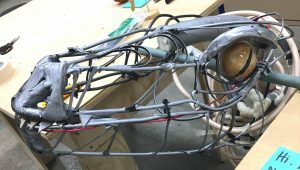 [Since two of our three raptors have exposed framework these details will inform how we can connect them and what materials might be best to hide or embellish our edges. ] 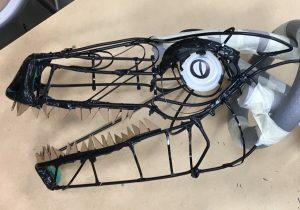 Once I secured the zip ties, I clipped the extra tails off of the ties and use them later as ribbing to illustrate the geometric convex and concave shapes of the 3-D form around the snout and lower jaw. By quickly painting the inside of a clear acrylic half-sphere (drawing the black slit of an eye in first), we had a really quick mock up of a lightweight and also illuminating option for an eyeball. 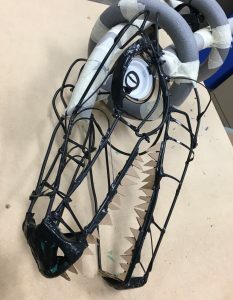 This first head mock up has foam on the snout where I ran out of material and improvised with soft materials (covered in electrical tape) deeming it ‘semi-appropriate’ for a buffer if the snout were to bump into anything or be used to move things around onstage. However, the bulk of the snout alludes to more of a donkey or horse nose than a raptor- an element I’m eager to improve for our next prototype. 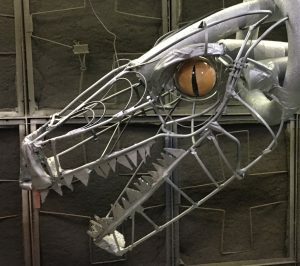 In our next version of this skeletal head frame we’ll be reconsidering a possible hinge-movement of the jaw, the proportions of the nose to the jaw, as well as the eyeball. A slightly smaller eye makes it look much more menacing and realistic. I hope to refine the style lines with a lighter weight ABS rod instead of the ¼” used on the majority of the frame. I used 5 pieces of the ABS rod to create the skeletal structure of this first head but it still (to my surprise) weighs less than most wigs I’ve handled. *A delicate (and much appreciated) hint left in the “Hatchery Lab” by our faculty who had researched and provided us with a sample of materials they’d seen used on similar projects.